Should there be contact bans in school? "My son's teacher is always hugging the kids and I think it's wonderful." Once again there are news reports making the rounds about banning “contact” at school. This time they aren’t referring to tip footy or to brandings (do they still even play that?) but to banning any form of contact between students or teachers. The issue first came to light when a West Australian school and a Victorian school banned contact such as hugs and high fives a few years ago. The usual amount of outrage spewed forth at the time with parents and media proclaiming we were becoming a nanny state and that our children’s childhood was being ruined. Once again there are news reports making the rounds about banning “contact” at school. Image via iStock. The premise behind the contact ban is understandable, we want our children to feel safe at school and we never want to place them in a situation where they feel uncomfortable. You can understand the reason for strict policies and procedures around contact with children in schools. But the thing is, a “contact ban” denies our children one fundamental component of happiness – touch. It&apos;s back in the news at the moment with a study released about the affect of having no-touch rules. At our local school there isn&apos;t a strict "no-contact" policy in place and I am glad of that. I&apos;ve seen my son’s kindergarten teacher hug her pupils, wrap her arms around them when they fall and weep, emboldening them with her kindness. She comforts them when they are lonely or worried. I’ve seen her on before-school playground duty with a pair of six-year-old twins hanging off each leg her arm protectively around their shoulders. I can’t imagine how a school could function without such kindness. At my daughter’s pre-school, teachers also cuddle the children. They stroke their hair and wipe away their tears when they are sad. They bounce them on their knees when they are anxious. They hold them tight when the tearful ones say goodbye to their mums and dads. While some parents I have spoken to express their unease at this, it&apos;s always given me comfort to know that they are being cared for. Many of our children either do not understand, or are still learning to understand the appropriateness of physical contact. Children look to us for approval and are testing out responses all the time. Always ensure there are other adults or responsible children around. Never show favour to individual children. Never touch a child in the area between the waist and mid thigh or near the chest. Never touch a child in a way that could be miss-interpreted as being anything other than friendly appropriate adult-child support. Where a child tries to get closer than appropriate, the message should always be along the lines of, “I like you and I enjoy being with you, but I would rather you held my arm/hand like this”. Some very active children sometimes calm down and focus on a lesson when having a gentle stroke e.g. on the back of the neck. In this case such a support mechanism must be written into the child’s Care Plan. Cuddles should be short and side by side. Never kiss a child, and do not encourage children to kiss adults other than their parents. A child should only sit on an adult’s knee for a short time and for a specific reason such as following an injury, and not too close to the body. If a child may need to sit on a member of staff’s knee for longer-term support, this must be written into the child’s Care Plan. Interestingly one of the Australian schools that banned contact a few years ago reversed the policy with the current Mt Martha Primary School principal Martin Page telling Fairfax Media the school no longer has a no-contact policy. Interestingly one of the Australian schools that banned contact a few years ago reversed the policy. Image via iStock. "I believe our current practises reflect usual, supportive contact between two people. I don&apos;t have a problem with giving a student a high-five or a pat on the back but there&apos;s a bit of a stretch between that behaviour and "at risk" behaviour. What we have to do as a profession is ensure that our staff is aware of what&apos;s appropriate and what&apos;s not: what&apos;s crossing the line and what&apos;s not," he said. 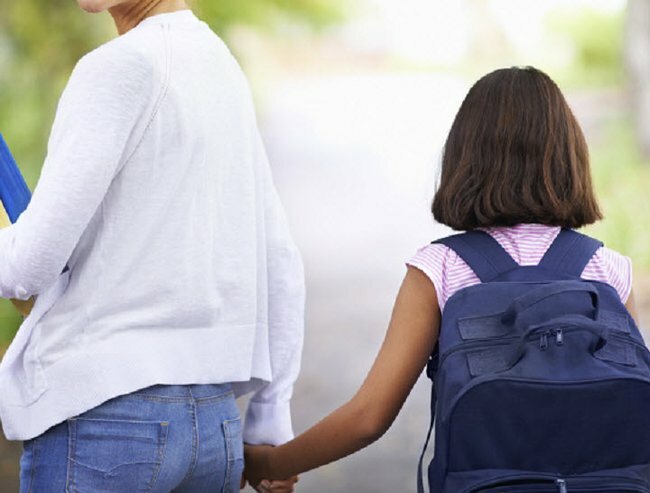 Professor Tiffany Field of the Touch Research Institute at the University of Miami School of Medicine told the ABC that when they examined the policy of no-touch in US schools they found that it has in fact not protected children against abuse to any degree. At my daughter’s pre-school teachers also cuddle the children. Image via iStock. Professor Field also said a study they conducted comparing children in Paris with children in Miami turned up an unexpected result. “The children in Paris received a lot more physical affection, both from each other and their parents and their teachers than the children did in Miami, and they were physically and verbally less aggressive than the children in Miami," she said. The benefits of touch are undeniable. The thought that my son’s teacher gives him a hug when he falls over and scares his knee fills me with joy. While both children and adults need to be aware of what&apos;s appropriate and children need to be taught to speak up when they feel uncomfortable, what I have seen is not scary or dangerous. It’s simple human kindness and we need more of it. What do you think of contact bans in schools?